On New Year’s Eve my wife and I saw the movie “Les Miserables”. We’d seen the musical on Broadway and had been enchanted by it. The music from it is superb and this musical fully deserves all the acclaim it has received through the years. As much as I loved the stage version of “Le Mis”, the movie took all of the greatness of the stage and added something to the mix that lifted it into subversive social commentary. That is what I’m going to write about, but first for those who are unfamiliar with either the source book, or the musical adaptation, a very brief synopsis is needed to set the scene. The story begins after the French Revolution and the defeat of Napoleon. The Royal Dynasty has been restored to power and the freedoms of the Revolution have been lost. The protagonist of this work is Jean Valjean. He was sentenced to twenty years of hard labor because of the ramifications of his stealing a loaf of bread for his starving sister. Imprisoned he is noticed by one of his Jailers, Javert, who notes Valjean for his almost super-human feats of strength. Valjean is paroled after serving his time and subsequently breaks parole. He is chased by Javert for the rest of the tale. The plot of the 1,900 page (in French) novel is summarized in detail at this link: http://en.wikipedia.org/wiki/Les_Mis%C3%A9rables Details of the play and the movie are available here: http://www.lesmis.com/. Hugo’s eloquence above and its implications for our current time is the subject that I want to discuss. Having spent a career working with those in poverty in NYC, I am quite familiar with the conditions, mental states and environment of people who are deemed “the underclass”. The movie I saw portrayed conditions somewhat worse than those I encountered in my work, but remember that now when indoor plumbing is commonplace and the wonders of technological advance have become affordable to most, we should expect better living conditions. Yet in other places in our country, perhaps Appalachia and in the rural South, conditions are not that much better than what was portrayed in this film. Certainly, in many countries around the world analogous conditions of poverty and human degradation exist. Yet in many other countries there has been considerable progress made to elevate the general human condition. The rich construct of a social safety net in most European countries ensures the amelioration of condition of those deemed the “lower classes”. 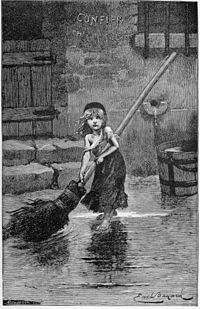 The various European social safety nets actually began in the latter half of the Nineteenth Century, partially as the result of books such as Hugo’s masterpiece and the works of other artists like Charles Dickens. Understanding how much progress has been made in the last one hundred and fifty years towards better living conditions for most people, with the knowledge though from personal experience of how far we still have to go to ensure an equitable life for all, I am disturbed by what I see as a trend among many to turn back this progress. Our country was born in Revolution, but our Revolution differed significantly from the French Revolution. Our American Revolution was fomented by the excesses of an imperialist power, exploiting the resources and the economy of overseas colonies to their detriment. The French Revolution came about because a small, privileged class exploited the resources of an entire nation via a tyranny of law from which this “Nobility” was exempt. Whether or not Marie Antoinette’s words were apocryphal: “Let them eat cake” was indeed the philosophy of the French royalty and nobility. Nevertheless, a short a time after the French Revolution the dreams of its’ participants were again shattered and the country was again under the tyranny of an elite social class. Myths die hard and especially in the dreams of average people trying to get ahead in life, who need the hope that they could by the dint of their own energy “pull themselves up by their bootstraps”. Besides, even for the lowliest of Americans there was the rage of the movies, that everyone could afford and that painted fantasies to ease their troubled lives. Our country was literally “slapped in the face” by the “Golden Age” of the “Roaring Twenties” that ended on the “oh so” sour note of the “Great Depression” accompanied by the “Dust Bowl”. http://jonathanturley.org/2012/11/24/humanitys-hubris/ These complementary calamities shocked most of the American people into the realization that the “American Dream” wasn’t as constant a reality as they were led to believe. Successful entrepreneurs lost their businesses and their homes. As the 1932 election drew near, our country was at a tipping point where the sheer hopelessness engendered by the “Great Depression” could well have led us to totalitarianism, as represented by either fascism or communism. The reason which I related what I saw in the movie “Les Miserables”, to our situation today is this. The portrayal of the degradation of the French lower class was so heart rending, that I began to see the historical progress since as an outgrowth of the realization that with such human misery comes the sense that if all is hopeless, then any action is justified to keep a person going. When you’re starving, stealing a loaf of bread, even if there might be dire consequences, is a justified activity. This action in the face of hopelessness was put so well by Bob Dylan “When you ain’t got nothin….you got nothin to lose”. The lesson that was learned in Europe and in the United States was that there needed to be some basic protections to keep the average citizen from the kind of poverty and degradation that leads to massive social unrest. As the French Revolution taught, violent social unrest is a bloody affair which nobody wins. As I wept all through this movie, such is the emotion its dark beauty arouses in me, there was a part of my consciousness pondering why are they letting it happen again? In the last thirty years we have seen the attempt to overthrow all of the programs coming out of FDR’s New Deal Philosophy. We see the Elite who think themselves nobility and with that thought there comes the desire to live fully as nobles. http://www.nationofchange.org/house-gop-taxes-wealthy-are-charity-1349010885 , http://jonathanturley.org/2012/07/07/mythology-and-the-new-feudalism/ and: http://jonathanturley.org/2012/03/10/what-motivates-the-1 To a great degree they have already achieved that. Mitt Romney has a great family pedigree, 500 million dollars, five houses and one with a car elevator. He sees 47% of the population as unproductive and sees himself as part of that small class of people essential to the United States. He is merely the representative of a movement that would destroy the social safety net, destroy Social Security and destroy Medicare. This destruction makes little sense for the Elite from a logical viewpoint, after all why not throw crumbs to the unwashed and keep them pacified? It certainly would seem to be an easier course than outright oppression. Outright oppression though, particularly of those you deem “unproductive” can be so emotionally satisfying to some. Then to, there is nothing more satisfying to some of the people “on top” than abject submission and the prostration at their feet of those less worthy, it makes one feel so special and so powerful. It is has long been my thought that there are those today who would see the people of the world under their boots, as much as the poor in Hugo’s novel, its stage version and finally this movie which I think equals Hugo in its’ portrayal of the underclass. For those who look beyond the mere plot-lines, such as me, there seems to be a very subversive undertone to this picture, which serves as a threat of what could come. If reason among our ruling elite cannot be restored through our governmental processes, where then are those downtrodden masses going to go and will that too end in futility? An impressive share, I just given this onto a colleague who was doing a little evaluation on this. And he the truth is purchased me breakfast as a result of I discovered it for him.. smile. So let me reword that: Thnx for the treat! However yeah Thnkx for spending the time to debate this, I feel strongly about it and love reading more on this topic. If potential, as you grow to be expertise, would you thoughts updating your weblog with more particulars? It is highly helpful for me. Huge thumb up for this weblog post!